It's been an exciting few weeks at the house, and while I'm good about loading these onto Facebook, I've been unreliable to do so here because it takes a bit more effort. This afternoon, Eames is down for a nap, so I thought I'd take an hour and give you a peek at what's been going on. Lots of things are happening since we had insulation installed in April. And now that we have walls again, things seem to be going quicker! Drywall is hung & primed! Floors are halfway in! Paint samples are on the wall! Ceiling is painted! We are in the homestretch for sure, which is crazy, since it has been 7.5 months since we closed on the house. We are IN LOVE with the floors. We looked and looked at samples. We considered wood, bamboo and even laminate flooring. We knew we wanted something not too light, not too dark, not too golden, not too red, and not too brown...and what we landed on was just PERFECT for this house. It's a hard maple by Lauzon, and it's shadow gray in color. I price shopped online and got a local store to match the great price I found, bringing it down $3 a square foot from their original quote. Crazy awesome! We also decided to go for the flush floor vents, so they are as seamless as possible. You can (hardly!) see one near the bottom of the photo above. There's a cold air return vent right when you walk in the front door. 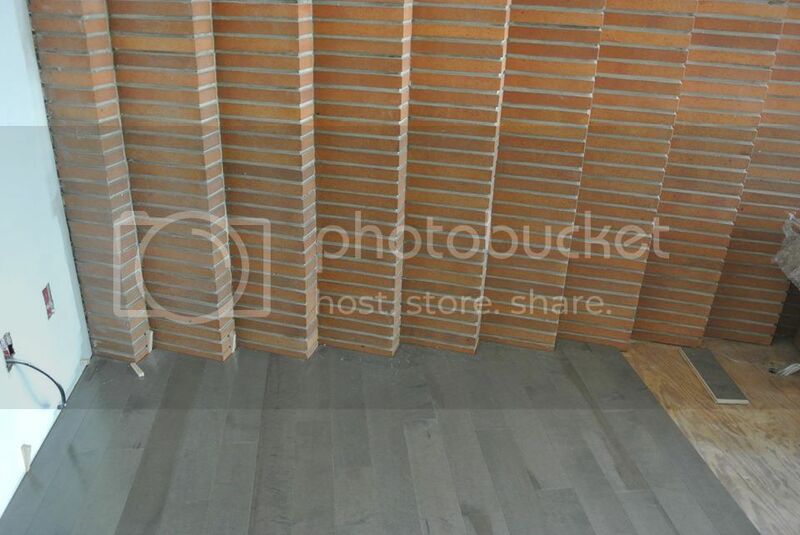 Here is a close up on the floor next to the stacked brick wall on the south side of the living room. 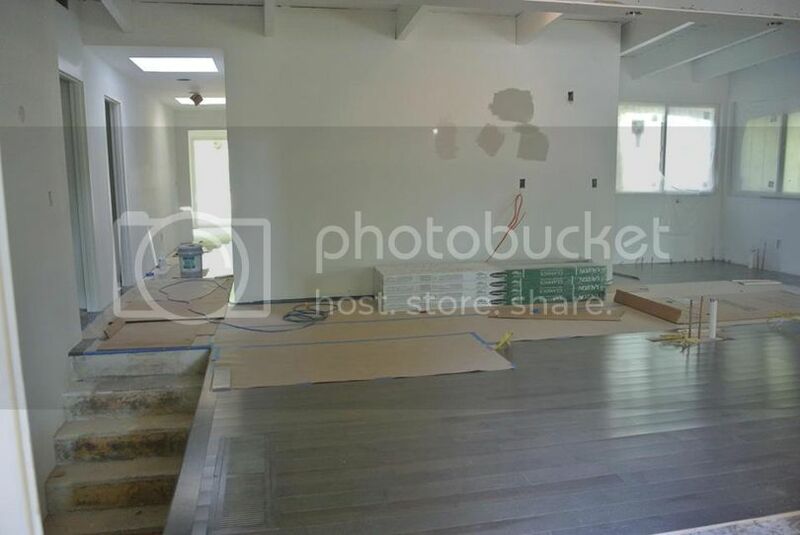 It's a favorite feature of ours, and we are thrilled with the work the flooring guy has done for us so far. 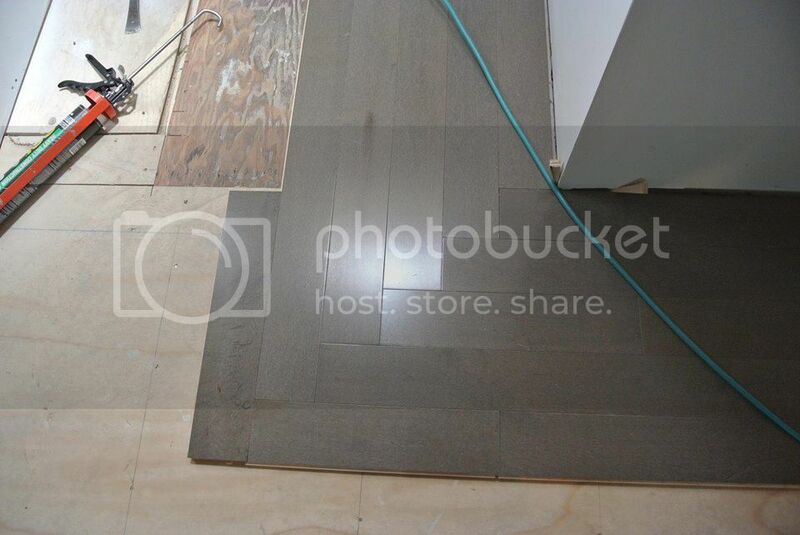 With the orange brick (which we are NOT painting), and gray grout, the brown floors looked too warm to us. These gray floors keep everything more modern and clean, and we are hoping they are perfect with the rest of our decor. Plus, they are solid wood maple, so down the line, if we get sick of them, we can strip them and restain them to any color. Total bonus of real wood. And, they should also outlive us. Another little detail I love is the transition. Apparently you need to lay wood floors the opposite way the floor joists go, and ours switches between the front and back part of the house. I didn't want a transition with a threshold between, so this is what I came up with. And I love it! Our builder thought it would look strange, but I told him he didn't have to look at it everyday - I did. Happy I stuck to this little detail. And because I love "before and during" photos, here is one of the living room, dining room and entry way. In the before image, you can't see the front door, since there was a little wall added to the home at some point. Greg took that wall down, and now you see the front door, the little landing over the stairway (which was that icky little bathroom! ), and the staircase leading to the basement (which was previously hidden by walls as well). There will be a metal railing coming soon, and all the floors in this area are the same, so it will be quite seamless. In the living area, we plan on using the same rugs we have in our current home - which are the GÅSER rugs from IKEA. They are super soft & plush, and we're hoping the size of the one we have works well in front of our new sectional sofa. It's amazing to me how much "cooler" the rock surrounding the fireplace seems now that we've nixed the yellow walls and natural wood T&G ceiling. It seems to be pulling more grays and blues instead of yellows and tans; much more our style keeping things cool and clean. The walls in this portion of the home will be gray (Benjamin Moore's Ozark Shadows for anyone wondering). Beautiful. I wish I'd been more obsessive about my wood floors -- ended up with a medium-brown stain which looks "fine" but not amazing. 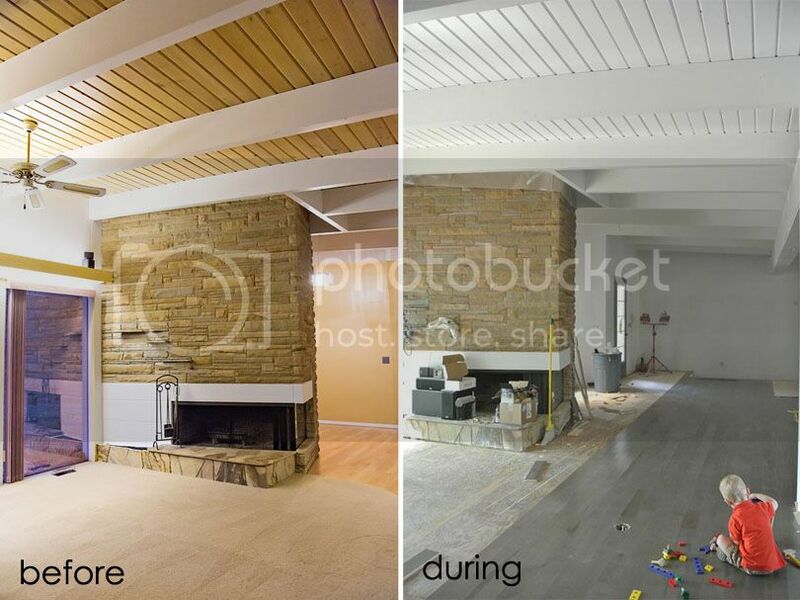 Your floors look amazing! Love what you've done so far; bet you can't wait until you can move in!